Tonight, the U.S. Olympic Hockey Team going to February’s Winter Olympic Games in Turin, Italy, will be announced. The 23 names on the team will be announced just before the Dallas Stars-Minnesota Wild game on the Outdoor Life Network. And there are two “men” who badly want to be among those names, but shouldn’t be–Chris Chelios and Jeremy Roenick. It will likely be the last shot for both, and denying them would be well-deserved karma. It’s been over 25 years since the 1980 U.S. Olympic Hockey Team defeated the Communist Soviet Union in the semi-finals of the Winter Olympic Games. Since there was no Olympic Games, this year, the real 25th anniversary celebration will probably take place at the February 2006 Games (there was a commemoration at the 2002 Games in Salt Lake). 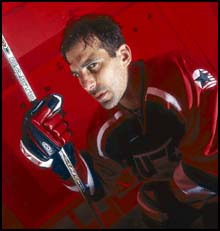 Chelios–who tried, but failed to make the 1980 Team–never belonged on the U.S. Olympic Hockey Team. But, unfortunately, he has served as the U.S. Team’s captain in at least two Olympics. Chelios is a punk, who threatened the life of NHL Commissioner Gary Bettman during the NHL strike in the mid-’90s and, as Captain of the 1998 Olympic team, broke furniture and trashed the dorms where his team was staying in Nagano. That should have barred Chelios forever from future Olympics, but didn’t. If ever there was a good argument to return to the class-act amateur players, like the ones who won in 1980, the spoiled, ingrate (but not Gold Medalist) Chelios is it. So is his friend and co-conspirator in the dorm and furniture trashing, Brett Hull, who retired earlier this year. Chelios should take a cue from Hull, and at age 43 (senior citizenship in hockey), retire. We’re tired of hearing Chelios whine and threaten. In addition to his threat on Bettman in the ’90s, Chelios attacked Bettman again during last year’s NHL lockout (which showed Bettman knew what he was doing–the players lost big), and is now attacking the new NHL Players Association leadership. Chris Chelios doesn’t compare to guys like my friend, Mark Wells, who returned from the 1980 Olympics with a Gold Medal, but no pro hockey career. For years after, he slaved nights as a night shift manager for Ram’s Horn 24-hour Restaurants. To hear that Chelios has a chance, yet again, to dishonor what Mark and the 1980 Olympians did in Lake Placid is sad news. Roenick said if fans don’t realize how hard Roenick and the other spoiled NHL millionaire crybabies are working to make the game of pro hockey better, “then don’t come.” This was during the NHL lockout when fans, indeed, were not coming to any games. There weren’t any because Roenick, Chelios, and company were holding out for even more millions. Not exactly the kind of guy we need representing America. This jerk doesn’t belong on Team USA or NBC. 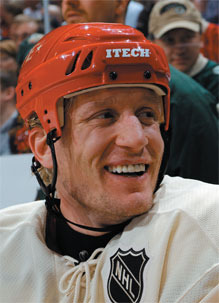 Please, USA Hockey, don’t put these overgrown babies, Chris Chelios and Jeremy Roenick, on the next U.S. Olympic Team. Just great. Take your puck and stay home, Roenick. Why not put Artest on the next USA basketall team and maybe they’ll start up a football team and can put Terrible Owens on the squad? Well said. I’m Canadian so I’m not going to cheer for the U.S. team anytime soon but I couldn’t agree more with your comments on those two. They are an embarrassment to your fine hockey team which I’ve had a soft spot for since 1980. They truly are spoiled whiners and not the kind of players that should represent any country – let along the U.S. with it’s awesome sports history. After all, there ARE great players out there with equally great attitudes. who even gives a (s..t) about the Olympics after Munich? They all deserve each other. Chelios made it, Roenick did not. coach like Latrell Sprewell or threaten his coach like Punk Chelios. The problem lies with about 75% of all coaches at all levels of sports. Little League is full of volunteer dads who undermine other kids and parents for their own kids advancement. Lies, collusion, backroom talk of other players and their parents, happens all the time. Football, soccer, basketball etc. are all the same. As a high school baseball coach, I can tell you that ego is the heart of the disease. Parents are egotistical about their child’s talent or lack thereof. Coaches, 75% of the time, are taking the credit for the wins and the tournament victories but almost never admitting to the defeats. Many times the coaches make mistakes in a game or contest and then say nothing or cover it up if it points to them. No respect for the players or responsibility of showing the right example for the players to see. It is a rare event to find Head Coaches who are genuinely involved for the benefit of the youth. It is almost always for their own satisfaction or their own agenda to move up the ladder of recognition on the school board or the money tree. They always come across as being the caring strong type to lead your kid but when politics get involved at the school you and your kid are out and then words like “Never were right for the team anyway” come out of their mouths. The examples of players observing horrible leadership and sportsmanship from coaches are common place and happen each and every season. When something is blatant and brought before the board it always comes down to a vote that is based on the following principal—-“Solidarity amoungst coaches”. So the coach keeps his job but the player and his friends live with the example of unfair play and politics to use for their standards in life. The cycle goes on and on and just gets worse. They stick together and then back each other regardless of the kid. Why do you think it took so long for players to come forward about steroids? Solidarity! Canseco was black listed for breaking it and Ken Caminitti died because of it. Jim Thorpe will never get what he deserved because not enough people are alive today who will make it right. My prediction for these “Olympic has beens”, Roenick & Chelios, will be the same results as Latrell Sprewell, Ron Artest, Steve Howe and the like. They will be given “Another Chance” ..”Another big money contract” because the good ol’boys club will follow the golden rule of “Solidarity amoungst Horse’s Asses”. A small correction of the facts. The USA did not beat the Soviet Union in a “semi-final” game in the 1980 Olympics as mentioned by Debbie. The format for that Olympic hockey tournament was based a total points system, giving teams 2 points for a win, 1 point for a tie and zero points for a loss. In fact, if the USA had lost the final game against Finland, the USSR would have still won the gold medal despite losing to the USA.